International Monetary Fund (IMF) expects India's real GDP growth will strengthen, partly due to government efforts to revive investment growth. IMF has estimated the country's GDP growth at 5.4% and 6.4% for FY2015 and FY2016 respectively in the latest World Economic Outlook (WEO). Sun Pharmaceutical Industries contributed rise of 37.51 points in the Sensex. It was followed by I C I C I Bank (25.18 points), Tata Motors (19.19 points), State Bank Of India (18.25 points) and Housing Development Finance Corporation (15.9 points). 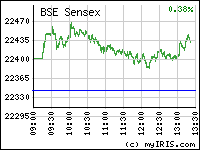 However, Infosys contributed fall of 22 points in the Sensex. It was followed by Tata Consultancy Services (20.77 points), Oil & Natural Gas Corporation (15.35 points), I T C (3.84 points) and Hindustan Unilever (2.87 points). Biggest gainers in the 30-share index were Sun Pharmaceutical Industries (7.14%), Hindalco Industries (4.16%), Tata Motors (2.59%), Tata Steel (2.27%), State Bank Of India (2.15%), and I C I C I Bank (1.41%). On the other hand, Tata Consultancy Services (1.76%), Oil & Natural Gas Corporation (1.55%), Infosys (1.42%), Bajaj Auto (1.02%), Hero Motocorp (0.90%), and Wipro (0.79%) were the biggest losers in the Sensex. The BSE Mid and small caps outperformed their larger counterparts gaining 1.28% and 1.59% respectively. The major gainers in the BSE Midcap were Allahabad Bank(2.62%), Aban Offshore (1.44%), Alstom India (1.02%), A B G Shipyard (0.68%) and CORE Education and Technologies (0.08%).The major gainers in the BSE Smallcap were Action Construction Equipment (12.39%), A2Z Maintenance & Engineering Services (9.94%), Trident (2.25%), Styrolution ABS (India) (1.96%) and Adhunik Metaliks (0.54%). The HC index was at 10,615.43, up by 251.26 points or by 2.42%. The major gainers were Aurobindo Pharma (2.07%), Cipla (0.84%), Biocon (0.18%), Dr Reddy'S Laboratories (0.1%) and Divis Laboratories (0.04%). The Realty index was at 1,533.39, up by 27.68 points or by 1.84%. The major gainers were D L F (2.89%), Indiabulls Real Estate (2.03%), Housing Development and Infrastructure (1.2%), Godrej Properties (0.66%) and Anant Raj (0.32%). The Metal index was at 10,313.31, up by 178.96 points or by 1.77%. The major gainers were Hindalco Industries (4.16%), Hindustan Zinc (1.56%), Coal India (1.21%), Jindal Steel & Power (0.8%) and Bhushan Steel (0.74%). On the other hand, the IT index was at 8,730.39, down by 136.96 points or by 1.54%. The major losers were Tech Mahindra (2.71%), Tata Consultancy Services (1.76%), H C L Technologies (1.71%), Infosys (1.42%) and Oracle Financial Services Software (1.34%). Market breadth was positive with 1,652 advances against 926 declines. D B Corp topped the value chart on the BSE with a turnover of Rs. 1,700.33 million. It was followed by Sun Pharmaceutical Industries (Rs. 579.03 million), Ranbaxy Laboratories (Rs. 484.82 million) and Infosys (Rs. 269.90 million). The volume chart was led by D B Corp with trades of over 5.84 million shares. It was followed by Suzlon Energy (4.38 million), Spicejet (2.92 million) and Unitech (2.29 million). DELHI: Supply of retail space in shopping malls fell by 65 per cent during January-March period in top eight cities of India to 3.5 lakh sq ft as completion of four malls got deferred, according to global property consultant Cushman & Wakefield. DELHI: If you have booked your dream house and are awaiting the possession in the developing new sectors of Noida, then there is good news for you.